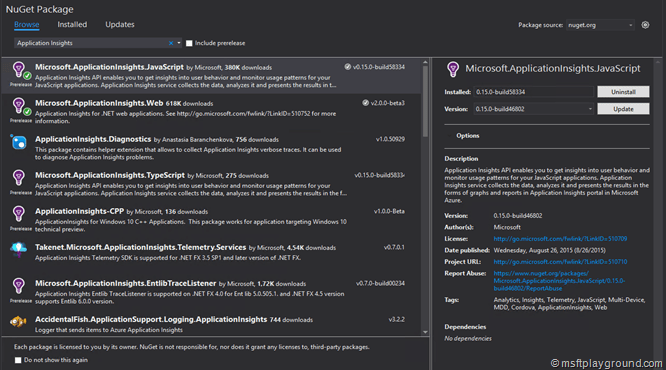 Starting with Application Insights can be done by adding NuGet Packages to your project. Microsoft.ApplicationInsights.Web: NuGet Package for .Net web applications. When running multiple instances of your application (development, test, acceptance and production), you don’t want all events to be registered in the same Application Insights instance. You can change the string value on every deploy but you can also make it configurable. When you start off the “_Layout.cshtml” file looks like this. To make that section configurable we open the “Global.asax” file in the project and add the following using statement. With this using statement you can set specific configurable values of application insights and in special the instrumentation key. After the using is added we add we add the application start event to the file and set the “TelemetryConfiguration” “InstrumentationKey” to a key we specify in the “Web.Config” file. When this value is set the below line will get the specified instrumentation key in you Razor files. 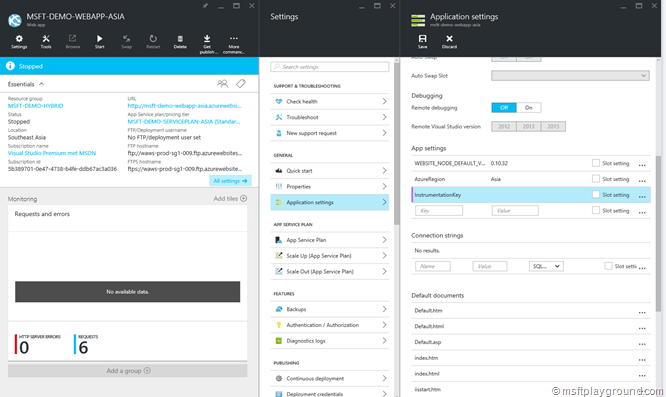 When this option is configured and deployed the instrumentation key can be altered by using the Azure Portal.